Updated: An earlier version of this article listed NFC as a feature. The Amazon version does not have NFC. Amazon has made the LG Stylo 4, a rebadged variant of the LG Q Stylus, available via its web site as a Prime Exclusive. Prime Exclusives are offered at slightly lower prices than retail and include a variety of Amazon apps and services preinstalled. The Stylo 4 includes a stylus and has a metal body with mil-spec 810G for protection against abuse and IP68 protection against water and dust. The Stylo 4 has a 6.2-inch screen with LG's 2:1 Full Vision (2,160 x 1,080) resolution. The phone is powered by a 1.8 GHz octa-core Snapdragon 450 processor with 3 GB of memory and 32 GB of storage. The phone comes with a 13-megapixel main camera and a 5-megapixel front camera with a wide-angle lens. The Stylo 4 has a 3,300mAh battery and specs including USB-C, Bluetooth 4.2, Wi-Fi, and LTE 4G. The fingerprint scanner is located on the rear surface. The phone ships with Android 8 Oreo and LG's pen-based software tools, such as memos and notes. Amazon is selling the LG Stylo 4 unlocked with support for AT&T, T-Mobile, and Verizon. (The phone is already being sold by Cricket Wireless and MetroPCS.) Amazon is charging $249.99, a savings of $50. Cricket Wireless will soon kick off sales of the LG Stylo 4, a rebadged variant of the LG Q Stylus announced earlier this month. The Stylo 4 includes a stylus and has a metal body with mil-spec 810G for protection against abuse and IP68 protection against water and dust. 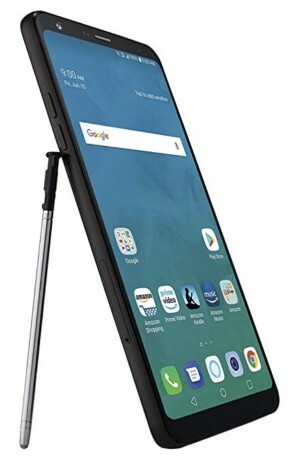 MetroPCS has kicked off sales of the LG Stylo 4, a rebadged variant of the LG Q Stylus announced earlier this month. The Stylo 4 includes a stylus and has a metal body with mil-spec 810G for protection against abuse and IP68 protection against water and dust.